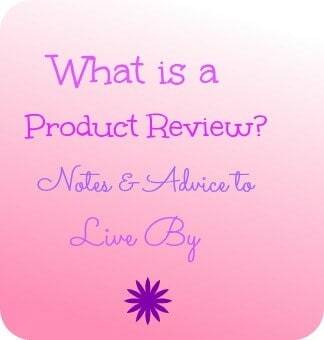 What is a product review? I’ve seen some confusion across the blogosphere lately about exactly what constitutes a review. These are my thoughts and what a review is on my blog. First off, a review is just what it sounds like. I try out your product and offer my thoughts, opinions and feelings on it. Because of this, I actually need to see your product. I need to use it, try it on, wear it, taste it, smell it, read it, watch it and otherwise get to know it inside and out. I need to do this for long enough to form an opinion. That means a book gets read completely. A DVD gets watched a few times. A piece of clothing gets worn, laundered & re-worn. A bath product gets used several times. A toy or game gets played with, etc. If someone offers to write a “review” based on photos and a press release, they aren’t reviewing your product, they’re promoting it. Now, there’s nothing wrong with promotion, I do that as well. But, let’s call an apple an apple. Promotion is not a review. They haven’t had the chance to form an opinion about your product. They’re simply parrotting back your sales pitch to their readers. Again, that’s fine if that’s what you want but it isn’t a review. A review should contain (and does on my blog) a description of what your product is, links to your site, photos of the product and possibly other products you offer, a note on where your product can be purchased and links to any newsletters or social media sites you have. Most importantly, a review should contain an opinion on your product after the reviewer has had a chance to use it. Did it work? Did it do what it was supposed to? Did it break? How did it impress me (or not)? Readers want to know a reviewer’s thoughts about the product. You can read a sales pitch anywhere but an honest review is much more valuable. Giveaways are nice and most bloggers love them because it draws more readers to their site. Some bloggers won’t do reviews without giveaways. Some won’t do giveaways without reviews. Generally speaking in a review you are giving the reviewer an item to keep once the review is complete. There are exceptions but that’s the industry accepted practice. If you want to offer a product as a giveaway prize too even better. Most reviewers want you to send this prize directly to the winner so please ask before you send both to the reviewer. I personally don’t like giveaways without reviews. If I’m putting my name on a promotion, I’d like to know that I’m promoting something that I agree with. If I’ve never seen your product, I don’t know that. While a giveaway will draw readers, I’m not comfortable attaching my name to a product I don’t know if I agree with. I will accept reviews without giveaways if that’s what the company wants.Â Many bloggers have different ideas of what’s acceptable so make sure to ask. A note for companies – Make sure you send the reviewer (whoever it is you choose) enough of the product to review. If you choose to send a sample, please make sure there’s an adequate amount for the reviewer to form an opinion on it. If you send a book, make sure it’s in a condition that they can read and enjoy it. Make sure it’s packaged securely so they can actually receive an undamaged product to write about. A note for reviewers – Spell check is your friend. Please, please, please if writing doesn’t come naturally for you, use spell check and grammar check to make sure what you’re writing actually sounds good. The company you represent wants a quality review that draws new customers to their site or at least honestly informs customers what to expect with their product. Product reviews are my passion. I love trying new things and letting people know about new products. I have a background in sales and a degree in Marketing so promotion comes naturally to me and its something I really enjoy. Whatever decision you make about a product review, I hope this article has helped you make an informed decision. The following guest post is provided by Ellen at Confessions of an Overworked Mom. .-= I’m a full-time mummy´s last blog ..â˜… Giveaway – Artiwood Letters â˜… =-. I agree with this 100%! Great resource Ellen! I love this post! Thank you for making it!